I was asked by Code Analysis to implement IDisposable interface because I was using IDisposable members (the Mutex). Is my Dispose() implementation good enough? Should I avoid it because it's never going to be called? RegisterWindowMessage API call should return UInt32... but HwndSourceHook is only accepting Int32 as message value... should I be worried about unexpected behaviors (like a result bigger than Int32.MaxValue)? In OnStartup override... should I execute base.OnStartup(e); even if another instance is already running and I'm going to shutdown the application? Is there a better way to bring the existing instance to the top that doesn't need to set Topmost value? Maybe Activate()? Can you see any flaw in my approach? Something concerning multithreading, bad exceptions handling and something like that? For example... what happens if my application crashes between OnStartup and OnExit? This might be against the spirit of Code Review, but you don't need to write your own single instance manager for WPF! Microsoft has already written code to accomplish this, but it has been poorly advertised. Step 1: Add the System.Runtime.Remoting reference to your project. Step 2: Add this single instance class to your project. Step 3: Implement the ISingleInstanceApp interface in your main application class in App.xaml.cs (this interface is provided by the SingleInstance.cs file). Step 4: Change your startup object by going to Project --> <projectname> Properties in Visual Studio, clicking the Application tab. 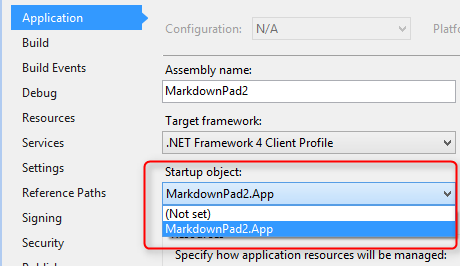 Locate Startup object: and select the <projectname>.App option. Step 5: Define a Main method in App.xaml.cs, and give it a unique string in the Unique variable. // TODO: Make this unique! Step 6: Right-click on App.xaml in the Solution Explorer, select Properties, and change the Build Action to Page. If you don't want anything to happen when a single instance is launched, you don't need to modify the sample code above. Rather than doing nothing when a user attempts to open a second instance of the program, it's often beneficial to Activate the original window and change its window state to WindowState.Normal, which can provide an improved user experience if the original window was minimized. Not the answer you're looking for? Browse other questions tagged c# singleton wpf or ask your own question.